This Unicorn sculpture is placed on a raised brick wall next to the Phoenix Art Centre. 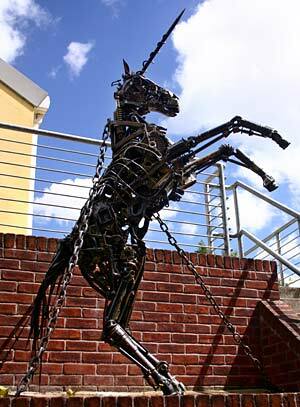 Made out of scrap iron by Simon Ruscoe, who graduated from Plymouth University in 1999. This piece was one of his first to be purchased in 1999. Ruscoe's trademark was using scrap materials for his work, and a 2009 work entitled Pony Power was on show at the Istorm Gallery on the Quay, priced at £7,500. Pony Power is a turning point for Ruscoe, as he announced that he was going to concentrate on sculptures made from sheet steel, rather than scrap. Other works by Ruscoe include Drowning Souls, a series of eight which was shown at Exeter Castle in 2008. In 2009, he was commissioned to produce a 13ft high hand holding a degree scroll, rising out of the ground, for Exeter University. The piece will be placed in the grounds of Rowencroft. Translated by Kevin Crossley-Holland: published by Penguin Books.